Dwight serves on the Board of Directors for Safe Haven Farms, Inc., an organization offering residential, day, and community services for individuals on the autism spectrum. This fall, Dwight participated in Safe Haven's second annual Walk On for Autism fundraiser. Now that Dwight Packard’s three daughters are older, he’s thinking about taking up a few outdoor adventures again. Like the time he climbed Mount Kathadin at the northern tip of the Appalachian Trail in Maine to mark his 40th birthday. Dwight grew up in West Chester when it was mostly cornfields. From around the age of 8 through college, he spent summers with his grandparents’ on Sebec Lake in Maine. He came to feel at home exploring the forest, looking under creek rocks for crawdads and fossils, occasionally finding a snake or a snapping turtle. Becoming an attorney was always part of the picture. Dwight’s father was a lawyer, as was his grandfather on his mother’s side. Dwight’s parents were his single biggest influence. They were good at finding ways to motivate him, he says. “My high school career could be described as mediocre. At the same time, I really wanted to go away to college, to the University of South Florida. But they weren’t interested in paying-out-of-state tuition if I wasn’t going to be a serious student. Dwight and his wife, Danielle, live with their daughters Rebecca, Megan and Madison in, oddly enough, Maineville. Dwight is a member of the Firm’s Business Services and Personal Client Services Groups. He has experience assisting clients in both the court room and the board room. Although he has an extensive background in commercial and fiduciary litigation, most of his practice is now devoted to helping individuals and businesses in the areas of commercial transactions, business succession planning, corporate mergers and acquisitions, commercial loans and financing, wills and estate planning, real estate and zoning law. He has assisted several clients in the food packing and tech industries. He has extensive experience with software and mobile application development companies. Dwight is licensed to practice in Ohio, Florida and various federal jurisdictions. He is a graduate of the University of South Florida, where he earned a dual-major B.A. He earned his law degree at the University of Dayton School of Law. 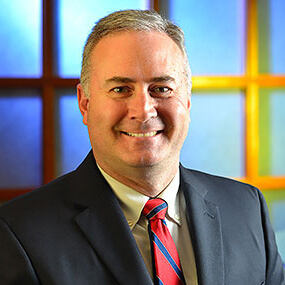 Dwight grew up in West Chester, Ohio and now represents many individuals and business in the Greater Cincinnati area, with particular emphasis on the Butler and Warren County areas. He currently resides in Warren County with his wife and three daughters. He is active in the community as a volunteer coach and mentor. He also serves on several civic and charitable boards in his community.